Commercial divers are highly skilled, trained to perform a multitude of underwater tasks. For most commercial divers, training began at either an accredited commercial diving school or a school sponsored by one of the branches of the military; this formal training was then supplemented by on-the-job training. 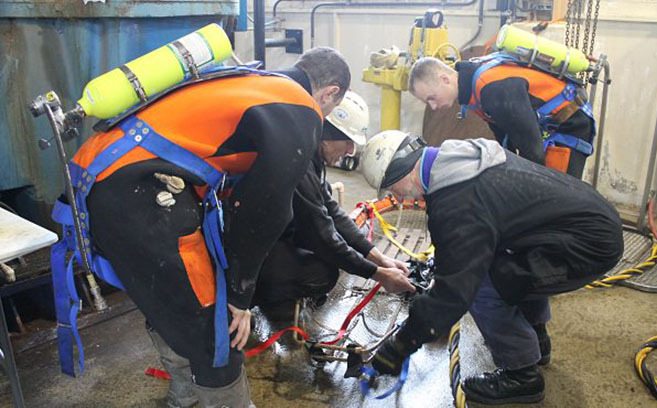 Commercial diver training includes diving physics and physiology, hyperbaric medicine, first aid and CPR, decompression chamber operation and maintenance, decompression and treatment tables, diesel engine and equipment maintenance, rigging, navigation, salvage techniques, underwater burning and welding, and underwater inspections – knowledge and skills necessary for the myriad complex tasks faced in the field. By comparison, recreational divers learn only basic diving skills, ordinarily through an organization such as the National Association of Underwater Instructors, the Professional Association of Diving Instructors, the Professional Diving Instructors Corporation, or a local YMCA. Recreational divers are taught about the equipment they will use, elementary diving physics, essential safety, and other basic skills. Although recreational divers in the United States are trained to safely enjoy the marine environment, their training falls far short of what is necessary to safely and effectively perform complex tasks underwater. Each year hundreds of recreational divers hire themselves out as “commercial” divers to unsuspecting clients, and each year tragic but predictable accidents occur, resulting in the fatalities of recreational divers who attempt to perform commercial tasks for which they were poorly (if at all) trained. Play it safe. For commercial work, hire experienced, certified, commercial divers. What do regulations and standards mean to a contractor who wishes to retain the services of a commercial diving company? Surface-supplied-air and mixed-gas diving has many advantages over traditional SCUBA-gear diving.